Skype for Business 2013 or 2016 will throw this error if you try to use it with older Lync servers. 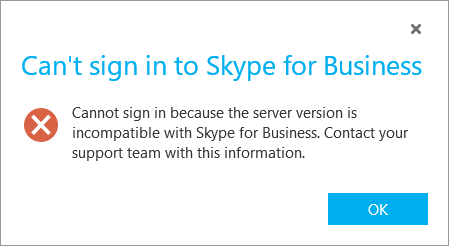 Cannot sign in because the server version is incompatible with Skype for Business. Fix: Add DisableServerCheck registry key. Reboot your computer (to reload the HKEY_LOCAL_MACHINE registry hive). Your Skype for Business client will work after reboot. You may download this file (right click the downloaded file and select Merge to add to the registry).